We just scored this lot on Craigslist.org! I paid $50 for the whole lot. 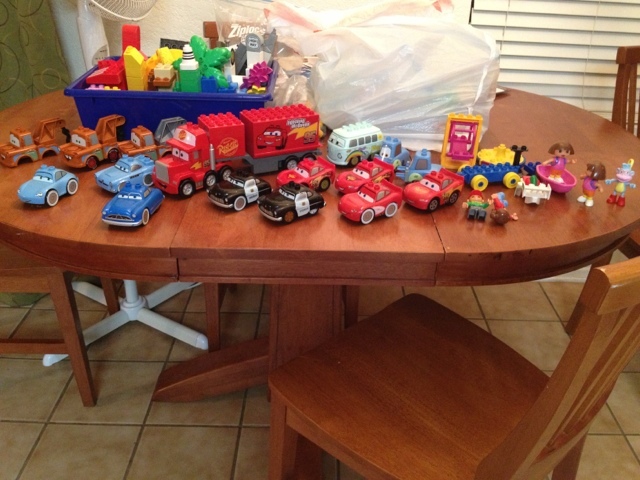 I really just wanted the DUPLO Mack truck and Sheriff from the Cars movie, but I got all of this as a bonus! My little guy was so excited! What a great deal!!! Now most of this stuff is in played with condition, but since LEGO doesn't make these any more, they are super expensive on Amazon and eBay . Besides, my toddler is just going to play with everything, anyway, so I don't mind the scratches on the pieces. Oh, and I bet you're wondering about the trash bag in the pic... that is all the Mega Blok! This lot came with some MEGA Bloks, too. I really can't stand that stuff. I think most LEGO people feel the same way. I have to give it away. It is just icky to me!